"The ice fields Ernest Hemingway once described as 'wide as all the world, great, high, and unbelievably white in the sun' have lost 82 percent of their ice since 1912-the year their full extent was first measured" (1). Mount Kilimanjaro, the highest peak in Africa, has recently been a focus of much attention, but not because of volcanic activity. While the volcano appears to be dormant on the inside the glaciers that have covered the top of the mountain for the past 11,700 years are rapidly disappearing. In 2002, a study led by Ohio State University ice core paleoclimatologist Lonnie Thompson predicted that ice on top of Africa's tallest peak would be gone between 2015 and 2020. Core samples taken from the glacier show that much of the past 11,000 years to have been generally wetter and warmer than present, but they also show evidence for three major droughts - 8,300, 5,200 and 4,000 years ago - the last of which went on for 300 years. Using a series of maps evidence of melting ice and snow has been surprising: in 1912, there were about 12.1 square kilometers of ice on the mountain, but a map in 2000 showed only 2.2 sq km of ice remained on the mountain - a loss of 80% of ice since then (2). Kilimanjaro's location - about 220 miles south of the Equator - places it in the tropics. Here, ice fields are particularly susceptible to climate change, and even the slightest temperature fluctuation can have devastating effects. If current climatic conditions persist, these glaciers on the summit could be gone entirely by 2020. Evidence of glacial recession on Kilimanjaro is usually dated back to 1912, but most scientists believe tropical glaciers began receding as early as the 1850s. Stefan L. Hastenrath, a professor of atmospheric studies at the University of Wisconsin, Madison, found clues in local reports of a dramatic drop in East African lake levels after 1880. Lake evaporation indicates a decrease in precipitation and cloudiness around Kilimanjaro. "'Less cloud coverage lets more sunlight filter through and hit the glaciers,' Hastenrath said, '[and] that increase in sunlight then provides more energy for evaporation of the glacier'" (1). Along with a higher risk of evaporation, a drop in precipitation also makes for a dark glacial surface, made up of old, dirty snow. This surface absorbs more solar radiation than fresh, white snow and in turn causes an increase in humidity which decreases evaporation. 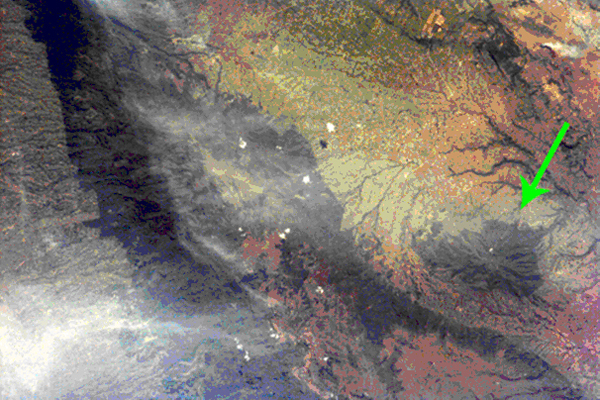 According to Hastenrath, "'the energy saved from evaporation is instead spent on melting. That might seem like a good thing-to stop evaporation of the glaciers-but it's certainly not. Melting is eight times more energy-efficient than evaporation, so now, with global warming, the glaciers are disappearing eight times faster than before'" (1). 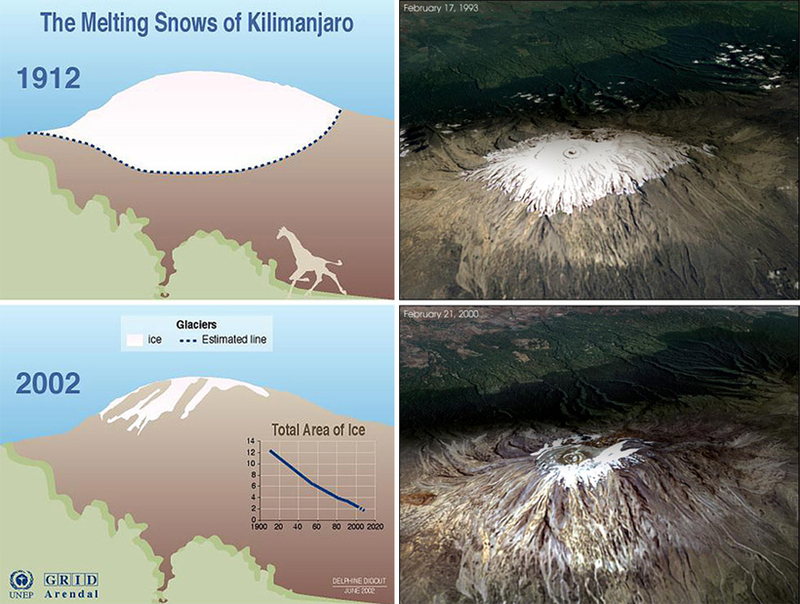 As another significant indicator of global warming, the loss of the Kilimanjaro ice fields carries "significant climatological and hydrological implications" for local populations who rely on water from the ice fields during the dry seasons and monsoon failures. Another aspect that can be devastated if Kilimanjaro melts away is the tourist industry. The loss of the ice fields also takes away one of the world's most well-known natural aesthetic sights. Since tourism brings more foreign currency into Tanzania than any other industry, and Kilimanjaro's ice-covered peak is a major East African draw. It is highly probable that losing these glaciers will have a significant affect the economy (1). It is important to note that global warming is not a universally accepted cause for Kilimanjaro's melting. When the Furtwängler Glacier was drilled for ice core samples in 2000, it was completely water-saturated. 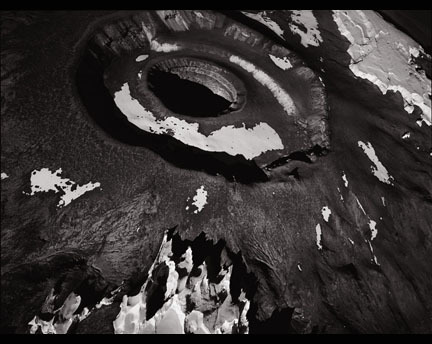 While Thompson believes that is because colder air surrounding the glacier kept its walls frozen even as the interior was melting, some scientists attribute the overflow to volcanic vents, heating the base of the glacier and melting the bottom layer of ice. According to Douglas R. Hardy, a climatologist at the University of Massachusetts in Amherst, "'the real explanations are much more complex. Global warming plays a part, but a variety of factors are really involved.'" He believes that forest reduction in the areas surrounding Kilimanjaro, and not global warming, might be the strongest human influence on glacial recession. "'Clearing for agriculture and forest fires-often caused by honey collectors trying to smoke bees out of their hives-have greatly reduced the surrounding forests,'" he claims. The loss of foliage causes less moisture to be pumped into the atmosphere, leading to reduced cloud cover and precipitation and increased solar radiation and glacial evaporation (1). Whether or not global warming or human factors has the largest influence on Kilimanjaro, these famous icecaps are disappearing. By using global positioning from satellites, aerial maps and an array of stakes placed on the ice fields, researchers have been able to confirm that Kilimanjaro's white cap is retreating in extent and volume.